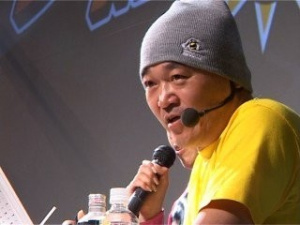 Takahashi Meijin, known to many as Master Higgins or as the master of rapid fire button-tapping, has announced he is leaving Hudson after nearly 30 years at the company. Joining the company in 1982, Takahashi rose to prominence for his ability to fire 16 shots per second in Hudson's Star Soldier, a skill that led to the creation of a specific practice tool, the 16 Shot! Shooting Watch that hit DSiWare last year. Takahashi also appeared in the Adventure Island games as Hudson hero Master Higgins. The farewell post over at the 16 Shot! blog doesn't explain Takahashi's reason for leaving. We spoke to the man about his work at Hudson back in 2009. I want to challenge this guy to a game of Mario Party. I've always been the undefeated king of the tapping minigames. This 16-Shot stuff is included in Adventure Island: The Beginning (WiiWare) and it's the last gold melon achievement I'm missing (I have 99 out of 100). I wish I had such triggerfingers so that I can finally complete the game, but I can only get up to 10 shots per second. 16 shots is crazy. I need to learn this tech. Can't read the number on the 16-shot device in the video though.. how much did he got? That's the same technique I learned! ......... D: I still can't beat his record (been playing the 16-shot game). The trick isn't to push down: The trick is to vibrate your arm/hand while lightly placing it ontop of the button. You vibrate it by flexing your muscle in a certain way. In the article they forgot to mention that he could split a Watermelon by just tapping it, chemicals not needed! It was to be expected that he would leave. A pity! He wasn't a real developer as far as I know, just a spokesperson. But he was Hudson's icon and the inspiration for Master Higgins (in Japan he was just called master Takahashi). It's further proof that Hudson soft is dead. Only the mobile games devision in Japan still lives. Very sad that it has gone this way. But I'll keep downloading their games when they arrive on the VC! Keep the spirit alive! "This 16-Shot stuff is included in Adventure Island: The Beginning (WiiWare) and it's the last gold melon achievement I'm missing"
No one can do it (as far as the world knows), only the master can!! So that's Master Higgins, didn't recognise him without his cap and grass skirt.